-His sitter is awesome about doing lots of musical activities with him. He's got a song that he's working on based on one of their Halloween decorations, Slim the Skeleton. Mal has been singing a line of it for days now: "My name is swim, swim the skelican, I so bony since I time (his attempt at died)". -He's really into hugs and kisses right now. I have to give them at least once before I leave the house for anything. Even his sitter and sitter's wife have had to give them. -He loves to pretend he's various animals (usually a dinosaur, monkey, or cat). Lately he's taken to hitting himself on the cheek and then saying "meow!" in a sad tone. -Speaking of hitting, the other day he was sitting on my lap and hit my knee with a small car he was holding. It wasn't hard and I barely noticed until he exclaimed, "Malcolm!! Be nice a Mommy!" Sadly, he didn't follow his own remonstration and almost immediately hit the car on my knee again. -If given the opportunity, he loves to help. He'll happily hand you dishes from the dishwasher and is getting quite good about helping to pick up toys at the end of the day. -His favorite part of picking up Gareth from school seems to be pilfering leftover food from lunches. He's come to prefer Gareth's friend's lunch to Gareth's. "See Noah runch?" is a daily refrain. Sometimes he's lucky and there's some leftover fruit or part of a sandwich. Even if I bring snacks with us, the big kids' lunch leftovers are his favorite. -A couple times now he's found the same girl, who is the same age as him, on the playground. He will not leave this poor kid alone once he sees her, and insists on roaring at her or trying to touch her jacket. All us grownups are pretty sure he's trying to play with her, but she wants none of it. She's got a couple older siblings and is apparently quite good at holding her own, but around Malcolm she holds tight to her mom's leg and shies as far away from him as possible. Several adults have attempted getting him to just say hi or something that doesn't involve being obnoxious to her, but he either gets upset ("No!") at the suggestion or completely ignores you and keeps roaring away. After trying to reason with him a bit we all give up and I finally succeed in finding something that will entice him away from the other child. -He loves to read. Over the summer the favorite was "no good very bad day". He's branched out a bit now and loves How Do Dinosaurs Say Goodnight? which is almost always followed by Brown Bear, Brown Bear What Do You See? which is usually followed by either Curious George Feeds the Animals or Spot Goes to the Beach, depending on which can be easily found. Almost always this same order. He will allow substitution of other dinosaur books if one is not accessible at the moment. And then once we read those the cycle either starts over or, if he's particularly agreeable at that moment, he might go pick out some other books to read. -He's fascinated by mushrooms. 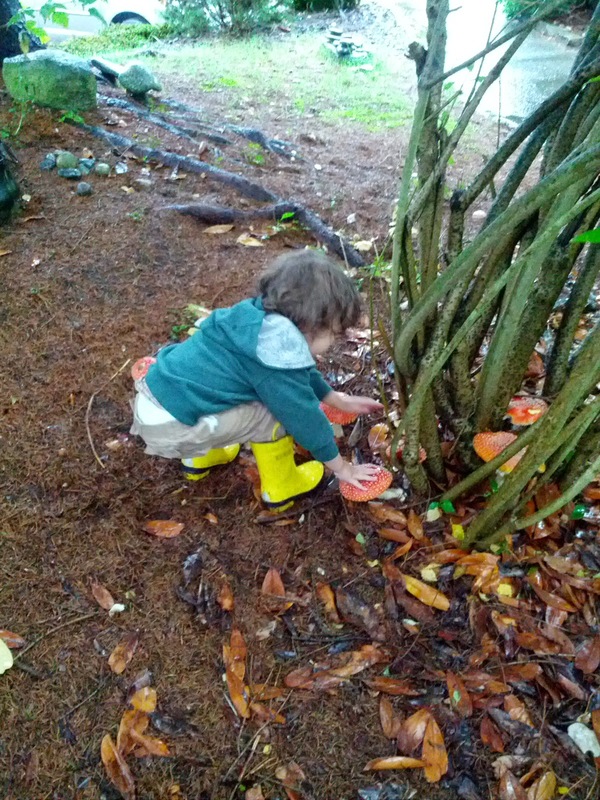 His sitter's house has a ton of awesome, huge mushrooms, so he likes to go check them out and touch them. Of course, half of what makes him cute is just the way he speaks and his facial expressions - hard to put down in the blog. The cuteness fades as they get older, so I'm trying to enjoy it now even though it comes with unpleasant characteristics on the side! I love hi little song! And the roaring at the girl part is priceless!